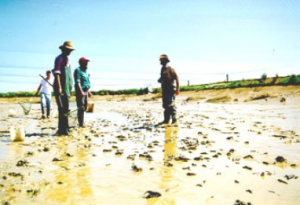 Oyster farming systems are broadly grouped as on-bottom and off-bottom culture. 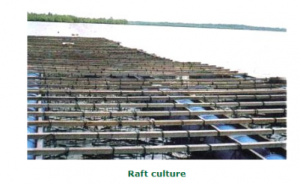 Raft, rack, longline and stake are used various off-bottom culture practices. The off-bottom methods are advantageous over the bottom culture in the following respects. Relatively rapid growth and good meat yield. Facilitates three-dimentional utilization of the culture area. The biological functions of the oyster such as filtration, feeding etc. are carried out independent of the tidal. Silting and predatory problems are minimum. Bottom culture: The oysters are grown either in the intertidal or subtidal area directly on hard substratum. For intertidal culture a minimum of a 16 hourd submergence is suggested to ensure adequate food supply. 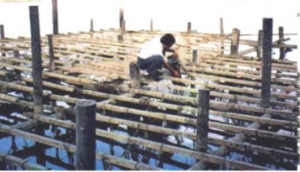 Oyster seed attached to the cllectors are planted on the bottom and allowed to grow for the market. The disadvantages of this methos are increased exposure to benthic, siltation and low production. In the farm the shell strings are suspended from racks. A rack covering 80sq.m. area holds 90 strings. In one hactare 125 racks are constructed. 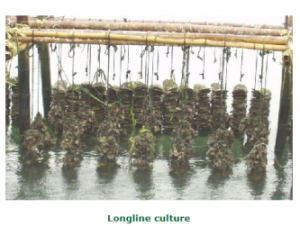 At the end of 12 months each string weights around 7 to 7.5Kg and the production of oysters is estimated at 80t/ha. The mortality (including those fallen) is about 45%.Rack-and-string method: It is also called ren method. The racks are constructed in 1 to 2.5m depth. There are several variations in the types of racks. The single beam rack consists of a beam placed and secured to the tope of posts driven into the bottom. A series of sigle beams are placed in a row. The cross beam rack is constructed by placing cross bar on top of single posts and two long beams are secured on the end of cross beams. 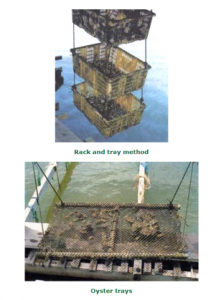 Rack-and-tray method: The nursery-reared single spat (cultch fee) measuring about 25mm are transferred to trays of size 40×40×10cm at a density of 150 to 200 oysterlings/trays. The tray is knitted with 2mm synthetic twine of appropriated mesh and is suspended from rack. Once the oysters reach 50mm length they are segregated and transferred rectangular trays of size 90×60×15cm and these trays are placed on the racks. Each tray holds 150 to 200 oysters. Each rack occupies 25sq.m. area. The average growth rate of the oyster is 7mm/month and at the end of 12 months the oysters attain an average length of 85mm. The production is estimated as 120t/ha/year. Compare to the string method, this method gives higher production but the production cost is high. Stake culture: a stake id driven into the substratum and on the top end one nail and on the sides two nails are fixed. The nail holds in position a shell with spat attached. The stakes are placed 60cm apart. In this methos, the nursery rearing of spat is earned on the same stake. For about two months the spat on the top end of the stake are covered by a piece of velon sreen. Once the oyters attain 25-30mm, the velon screen is removed and in another 10 months they reach the marketable size. The growth rate of the oysters in this method is the same as that the oysters raised by the string method. The production is estimated as 20t/ha/year. Longline culture: In this system long ropes or cables are anchored at each end and are supported at intervals by floats. Lonflines of 50-100m length are easy to manage. Double lonlines comprising one line on either side of the floats are also used. Oyster strings are hung from longlines. Longlines withstand roughsea conditions better than rafts.Raft culture: A four-barrel (each 200 l) raft supports about one tonne, less the weight of wooden frame. Strings of oysters weight about 5 times less in water than in air. The rafts are desighned taking into consideration the expected weight of oysters at harvest. Strings, trays, lantern nets, bag nets and sticks can be suspended from rafts. In India oyster culture from rafts has not been attempted.